The Salisbury Township School District is pleased to offer incoming 5th and 6th grade students (2012-13 school year) the opportunity to participate in a free summer computer camp. 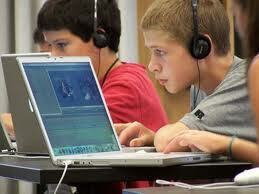 Participants will work together to create and share multimedia projects using a variety of software on the Mac. Computers, cameras and iPads will be provided. The workshops will be led by Christina Westfall and Matt Ritter, computer technicians in the school district. All sessions are open to incoming 5th and 6th grade students, regardless of which elementary school the child attends. Space is limited, so sign up soon! Please direct any questions to Christina Westfall (cwestfall@stsd.org) or Matt Ritter (mritter@stsd.org) or call 610-797-2062. You can learn more about the Summer Computer Camp for 5th and 6th grade students by downloading the Summer Computer Camp Flier.